In 2002 Eddie Halliwell had reached the highs of superstardom but his Mixmag cover CD, ‘Bosh!’, took him to a whole other level. Named as Mixmag’s ‘DJ of The Year’ in both 2003 and 2005, he was also nominated as one of ‘The Greatest DJs’ of all time, whilst snapping up a Radio 1 residency and selling out BOSH! shows up and down the country. This was followed by another ‘BOSH!’ album and then a 2015 re-release on Mixmag Recordings. Now, BOSH! is back on tour. 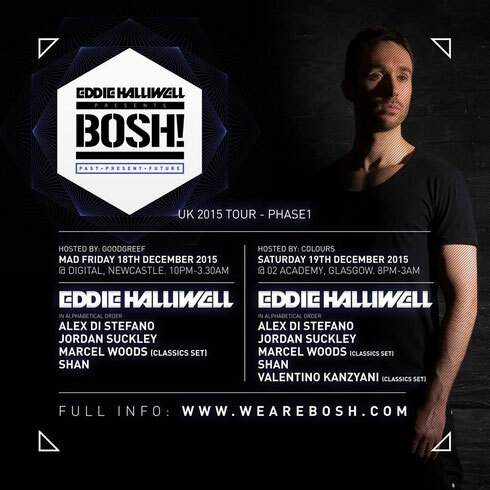 On 18 December, Eddie will be heading at the Digital nightclub in Newcastle to give some past, present and future BOSH! with DJs like Alex Di Stefano, Jordan Suckley, Marcel Woods and Shan, to put on a rendition of everything everyone has ever enjoyed about the album that struck the right cord with so many. The next night, 19 December, BOSH! will go further north to Glasgow at the O2 Academy with the full force that everyone would expect from the brand. These events will mark Phase One of the BOSH! return, with Phase Two kicking off in 2016.